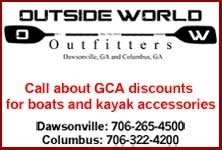 First part of Section IV of the Chattahoochee River (“Hooch”) on Saturday, April 27th – from Wildwood Outfitters to the takeout at Mossy Creek. Distance about 4.5 miles. This is a class I-II river. These trips are for trained beginners and higher level paddlers (the latter are needed to help rescue any swimmers). The coordinators will be Brannen Proctor and Carol Reiser. Please call or email Carol Reiser for more details, Phone: 404.597.2128 or email Creiser11@gmail.com.